Who are you? Lauren Wright, curator and writer, and Noam Leshem, political geographer. Why Margate? Lauren: a job came up here in 2010 and when I came for interview I was overwhelmed by how beautiful it was from the minute I stepped off the train. We’d been living in London for over five years, and I didn’t realize how much I missed open sky (I’m from Colorado originally). Once I got the job, Noam came with me to look for a place to live. It was the annual Beach Cross weekend and he was a little concerned that there were always dune buggies driving all over the beach. But he quickly fell in love, too. Now we split our time between here and London, though Noam recently got a job in Durham, so that’s going to make things a little more complicated. How do you define style? Lauren: Simple and comfortable with a small hint of crazy. Noam: That’s really hard… it’s constantly changing, reflecting moods and life phases. But for me, it’s the little things that make a space meaningful: books collected, artworks given to us by friends, objects we found while travelling. If you could go back and live in another era from a design point of view, when & why? Noam: Islamic architecture in the middle ages had that rare combination of public and private space with courtyards that connected generations, friends, and associates. It’s a bit like the new steps in Margate. Lauren: I’d live in the Georgian period. They really knew what they were doing with light and generous space, and they were just starting to discover the wonders of the sea. Best and worst thing about your move to Margate? Best: We’ve discovered a wonderful community of lots of friendly people who really care about the town. It’s so nice to bump into people we know in the street, and be able to have 10 friends over for dinner at 15 minutes’ notice. Worst: Adjusting to living in two different cities. We miss each other and we always seem to be in the wrong place when exciting things are happening. And we had to get two of everything. How much work have you had to do to make your home your own? It’s still a work in progress. We bought the flat at auction in 2010 and it took 18 months to figure out what we wanted and get the work done. It hadn’t been touched since the seventies and we stripped everything out and rearranged it to take advantage of the light, space and views. There are still many unfinished corners, but that’s life! If you could change one thing about your home what would it be? I would pedestrianize the road in front of it. It’s so nice to watch people walking around and enjoying the seafront; it’d be double the fun without all the cars! Best thing about your home? The sun follows you around all day – it rises into our bedroom and bathroom in the morning, then shines into the office during the day, and sets in the kitchen and living room in the evening. And the views aren’t too bad. What building would you like to be locked in overnight? Noam: The White House – you might just catch Barack Obama having a peanut butter toast in the kitchen at 2am. Lauren: MoMA circa 2000, before it expanded and became huge! I saw an exhibition there then that changed my life, and I’d love to haunt those works for a few dark hours. What couldn’t you live without? Sun. What would you do if you were Mayor for a day? Lauren: I’d issue a decree that the historic fabric and natural environment of Margate and Cliftonville’s seafront and beaches be preserved forever. Noam: She’s an over-ambitious do-gooder. I’d ask every resident of the town to stop for five minutes and look at the sea. If you were exiled to the Maunsell Sea Forts what three things would you take with you? A sailing boat, an internet radio and the pile of New Yorker magazines in the bedroom. What inspires you? Lauren: Great art and all kinds of people talking about it. Noam: Seeing people figure creative ways out of even the most difficult circumstances. I work a lot in Israel and Palestine, so I get to see quite a bit of this. Who are your heroes? Lauren’s 95 year-old grandparents, the late broadcaster Daniel Schorr, the Jewish-German philosopher Walter Benjamin, and Merce Cunningham. In 10 years’ time where will you be? As much as we love it here, we hope we’ll be living in Colorado, Lauren curating and writing, Noam teaching and writing, and both of us skiing as much as we like. And we’ll visit Margate as often as we can. Favourite item purchased in Margate? Our flat! And all the wonderful artworks we’ve bought in town by artists local and international on the walls. Best advice you’ve been given? If it’s hard it means you’re on the way up. And if your relationship is working under a particular set of circumstances, think really hard before you change them. What are your goals for the following year? Noam: to complete my first book and stay curious. Lauren: to make a good start on my first book and get a big show I’m working on for 2015 all sorted out. Plus start to figure out the geography of my next five years or so. 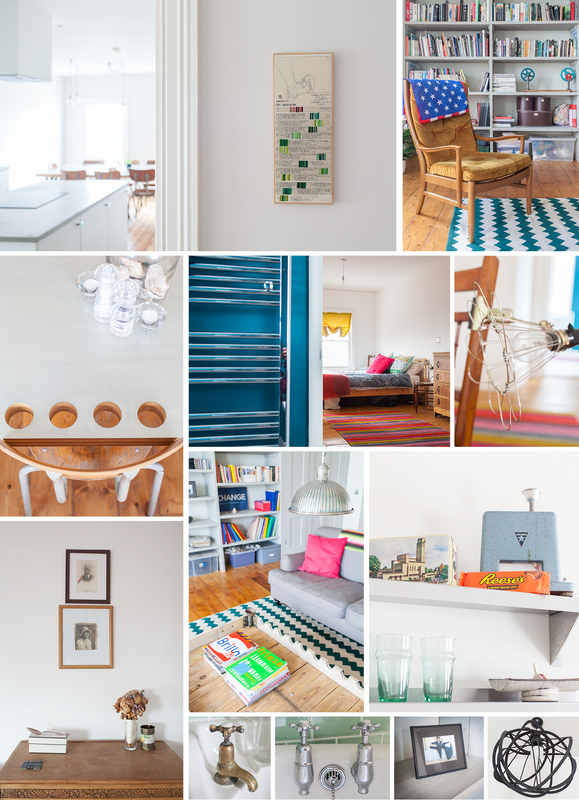 ROUND-UP: Lauren & Noam’s late Victorian sea front property is clean & bright with fresh white walls & pops of colour in the form of art & furnishings. The flat is ordered & minimal, no fuss, yet functional & stylish. Carefully chosen pieces adorn the flat but do not overpower it, making the most of the size & space. 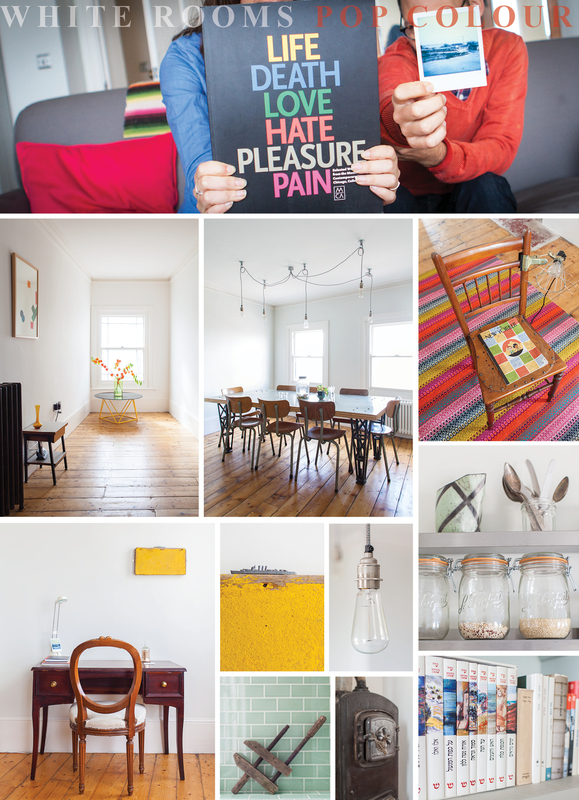 Lauren & Noam have renovated their flat completely & have streamlined their home creating a contemporary living space. RECOMMENDATIONS: Lauren & Noam have chosen artwork by various local artists – Nick Morley and Bryan Hawkins (pictured). And furniture from Junk Deluxe.